Solera aging, perfect craftsmanship, extremely limited supply … the only question that’s left is if you are going to get one of these bottles for yourself? The history of Albert Michler Distillery goes all the way back to the early 1863 in Austria where they made specialty liqueurs and Absinthe for the Austrian Empire. Well, it seems that empires come and go, and so do companies—Albert Michler’s was destroyed in WWII. But fine distilled spirits are coveted in any age, so the brand was recently revived. Now located in the UK, Albert Michler Distillery and Rum Warehouse has a full line of Rums, Gins, and Absinths available for your empirical pleasure. 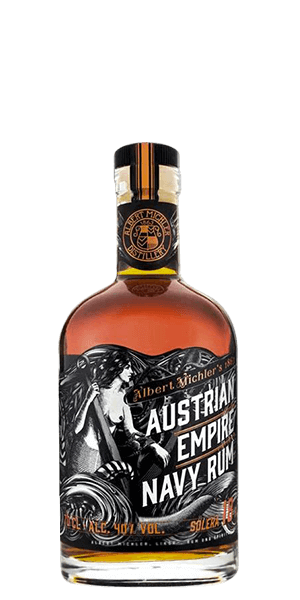 The first thing that you need to know is that the total annual production of Albert Michler Austrian Empire Navy Rum Solera 18 YO is 890 bottles. The reason that there are only 890 bottles is that this is real, traditional, Solera-method aged Rum. In Italy, this kind of aging is called “Perpetua” and it utilizes a long line of barrels that are mixed and married over time with only a portion of it removed at the end. That means that 18 YO is the YOUNGEST Rum in the bottle. There is just no way yet known to mankind to mass produce spirits this way. And it means that, over time, the average age and quality of the Rum just keeps getting better and better. And Michler sources their Rum from a single producer in the Dominican Republic, so it starts off right to begin with. The only question that’s left is if you are going to get one of those 890 bottles for yourself? What does Austrian Empire Navy Rum Solera 18 YO taste like? The Flavor Spiral™ shows the most common flavors that you'll taste in Austrian Empire Navy Rum Solera 18 YO and gives you a chance to have a taste of it before actually tasting it. Sehr guter Rum. Gerne wieder. Absulutely great rum, tasted splended !